NETWORK FINALS: As we noted late yesterday, THE OSCARS adjusted to 7.7, up 0.9 from last year’s finals, and in addition, LIVE FROM THE RED CARPET adjusted to 2.6. Elsewhere, the rerun of FBI lost 0.1 in final numbers. CABLE HIGHLIGHTS: AMC’s THE WALKING DEAD wasn’t hurt by airing against The Oscars, up 0.03 to 1.71, with TALKING DEAD up 0.03 to 0.62. On HBO, the season finale of TRUE DETECTIVE had no trouble either, up 0.09 from last week to 0.43, with LAST WEEK TONIGHT up 0.02 to 0.29, CRASHING down a tick to 0.12, and HIGH MAINTENANCE down 0.02 to 0.05. Adult Swim’s HOT STREETS was at 0.31/0.29. 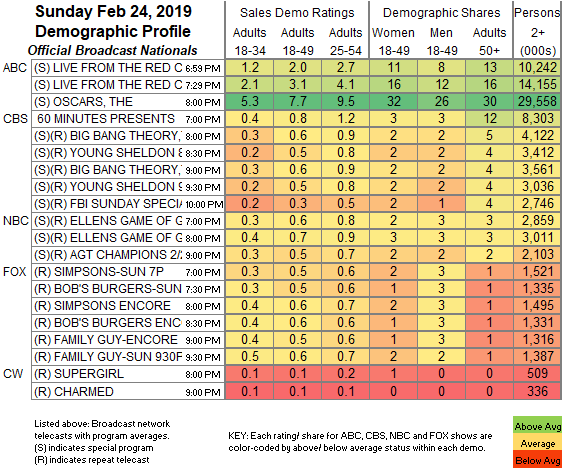 On Showtime, SHAMELESS fell 0.08 to 0.24, BLACK MONDAY lost 0.02 to 0.06, SMILF stayed off the chart and ticked down to 0.04/142K, and THE CIRCUS was steady at 0.04/180K. Hallmark’s WHEN CALLS THE HEART returned at 0.22. Unscripted was led by E!’s two helpings of ACADEMY AWARDS RED CARPET coverage at 0.55/0.49. Food Network’s WORST COOKS IN AMERICA ticked down to 0.44. 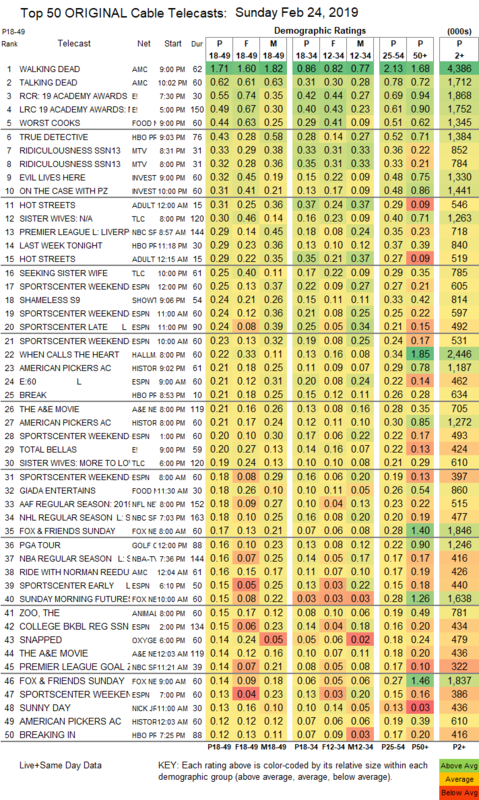 MTV’s RIDICULOUSNESS was at 0.33/0.32, compared to last week’s 0.34/0.33. On ID, EVIL LIVES HERE gained 0.04 to 0.32, and ON THE CASE returned at 0.31. On TLC, SISTER WIVES fell 0.06 to 0.30, and SEEKING SISTER WIFE was steady at 0.25. NBC Sports Net’s PREMIER LEAGUE match was at 0.29. E!’s TOTAL BELLAS was steady at 0.20.